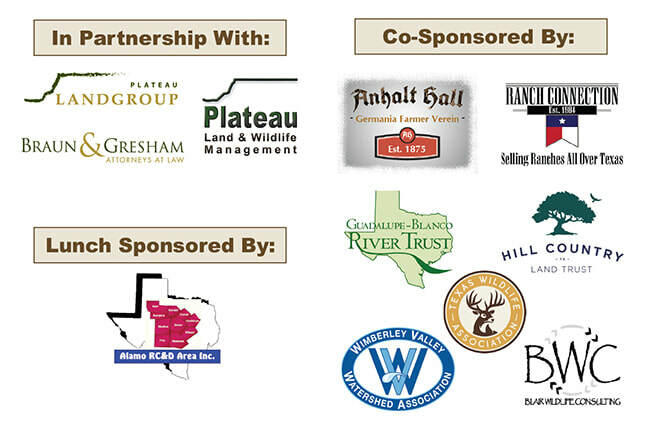 ​Spring Branch, Texas — The Comal County Conservation Alliance (CCCA) and the Hill Country Alliance co-hosted the workshop, “Saving Family Lands: Tools for Landowners in Comal County,” on February 15, 2019 at the Anhalt Dance Hall in Spring Branch, Texas. Many thanks to our amazing hosts, presenters, sponsors, and attendees for the Saving Family Lands Workshop. James Bradbury PLLC "Conservation Easements in Texas"
Margaret Menicucci Braun & Gresham Attorneys at Law "Conservation Basics & Income and Estate Tax Benefits"
Shane Kiefer, CWB Plateau Land & Wildlife Management "Introduction to Wildlife Management Property Tax Valuation"
Chris Abernathy Texas Parks and Wildlife Department "Texas Farm and Ranch Lands Conservation Program"
Carrie Kasnicka Guadalupe-Blanco River Trust "Land Trust 101"